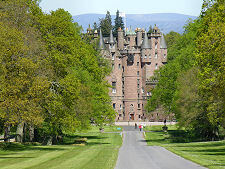 Glamis Castle stands in open Angus countryside some four miles south of Kirriemuir and five miles south west of Forfar. The word "splendid" could have been coined specifically to describe it. Never quite symmetrical from any angle, this is one of the most visually pleasing castles in Scotland. There is something about the massive central keep, the conically roofed corner towers, the central stair tower and, above all else, the crenellated roofline and array of projecting turrets that makes this as near a perfect Scottish castle as you could imagine. The sense of splendour begins as soon as you enter the castle grounds, though the Queen Mother Memorial Gates which, since 2008, have stood at the west end of the village of Glamis. From here a dead straight avenue a little under a mile long is aligned perfectly with the castle's central stair tower, and as you approach the view of the castle gradually opens up, set against the Angus hills in the background. It was an accident of history that led to the basic building blocks of the castle being primarily aligned north east to south west, but we have the 3rd Earl Earl of Kinghorne to thank for producing the overall arrangement we see today in the late 1600s, and for the alignment of the avenue along which you approach. The end result is a remarkably impressive entrance. 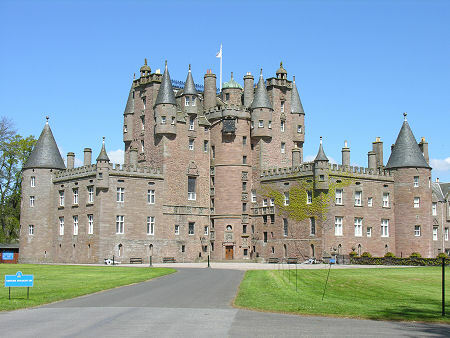 Glamis Castle is surrounded by grounds and gardens, including the Italian Garden, the pinetum and the walled garden. 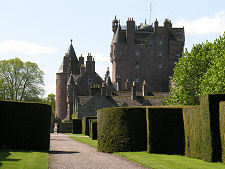 You can find out more about Glamis Castle Gardens from our feature page about them. 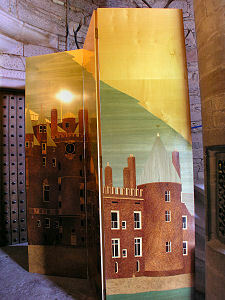 On this page we focus primarily on the castle itself. 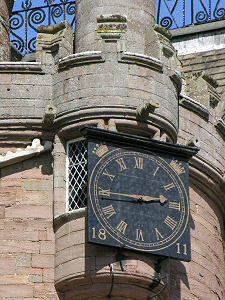 Glamis Castle has ancient origins. There was a religious centre on or near the site of St Fergus Kirk in Glamis, a mile to the south, dating back to the 600s. The first building on the site of today's castle seems to have been a royal hunting lodge, perhaps comprising a fortified house with a wall surrounding a courtyard. History and legend (and drama) become a little confused in the early story of Glamis. There certainly seems to have been an established royal residence at Glamis when King Malcolm II of Alba was assassinated here, in circumstances that remain unclear, on 25 November 1034. 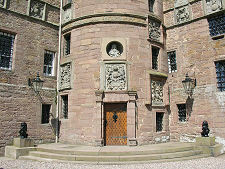 Part of the oldest part of the castle has traditionally been called "Duncan's Hall", after King Duncan I, Malcolm's grandson and successor as King of Alba. 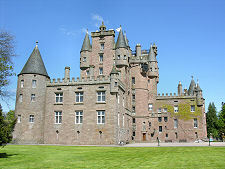 It is certainly possible Duncan visited Glamis, but the part of the castle in question was not built until the 1400s, nearly 400 years after Duncan's time. Even more tenuous are the traditional links between King Macbeth, who succeeded (and killed) Duncan in 1040. Shakespeare's witches describe Macbeth as "Thane of Glamis" and "Thane of Cawdor", and tell him he will "be King hereafter". but you have to remember he was a playwright and not a historian. Legend is only displaced by history in 1372 when King Robert II of Scotland granted the Barony of Glamis to Sir John Lyon of Forteviot. Four years later Sir John married Robert's daughter, Princess Joanna. 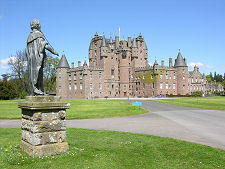 It was their son, Sir John Lyon of Glamis, who began work on turning the old royal hunting lodge he had inherited into the Glamis Castle you see today. Starting in 1404 he built what was at the time called the Palace House, and now forms the core of the east wing of the castle. John's son Patrick was made 1st Lord Glamis by James I. In about 1435 he began work on the castle's great tower. Construction continued after his death and was completed in 1484. This stood to the west of the Palace House and the two were not physically connected. It was only a century later that the great tower was expanded to bridge the gap and unify the existing structures into a single building. 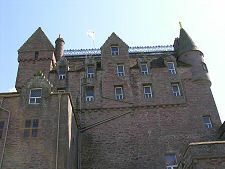 The angle of the "L" contained the round stair tower that is the focal point of the castle today. At this time the castle would have had a courtyard on its southern side in which ancillary buildings were erected. The courtyard and castle would have been surrounded by a barmkin or defensive wall. Holding onto power and property in medieval Scotland was very much a case of ensuring you backed the right factions in any conflict and, above all else, that you didn't fall out with the monarch. The Lyons of Glamis nearly came unstuck over an argument that had nothing to do with them in the early 1500s. As a child, James V was dominated, and later kidnapped, by his stepfather, Archibald Douglas, the 6th Earl of Angus. When James V gained power in 1528 he took his revenge on the whole of his stepfather's family. Archibald Douglas's sister, Janet Douglas, was the widow of John Lyon, 6th Lord Glamis. James V brought charges of witchcraft against her, had her imprisoned in Edinburgh Castle and then, in 1537 had her burned at the stake in Edinburgh. 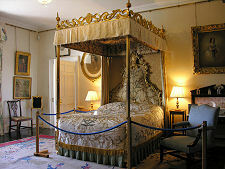 Meanwhile James had seized Glamis Castle for the Crown and frequently made use of it over the following five years. Even though he was a child, Janet's son John, 7th Lord Glamis, was also condemned to death by James V. He was only released, and the (ransacked) castle returned to him, when James died in 1542. 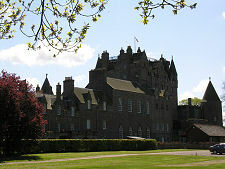 Relations with the crown were fully restored when Mary, Queen of Scots stayed at Glamis Castle in 1562. John, 8th Lord Glamis was one of the most powerful, and richest, nobles in Scotland. His son, Patrick, was made the Earl of Kinghorne by James VI/I in 1606, and was a member of the king's royal court in London. The 2nd Earl of Kinghorne lost most of his family fortune backing the Covenanters during the religious wars of the mid 1600s. The 3rd Earl, another Patrick, took the title of Earl of Strathmore and Kinghorne. He re-established the fortunes of the Lyon family and undertook extensive rebuilding work at Glamis Castle, apparently to his own designs. He built the west wing, which helped provide a balance to the original east wing. He also realigned the estate so that the avenue approached the castle at the the angle which so impresses visitors today. Patrick was also responsible for turning the old great hall of the medieval castle into the fine drawing room you see today. John, the 5th Earl, supported the 1715 Jacobite uprising and was killed at the Battle of Sheriffmuir. 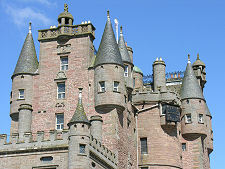 A month later and before fleeing the country as the uprising collapsed, James VIII/III, or "The Old Pretender" stayed at Glamis Castle with 88 of his supporters. While there he is said to have healed a number of locals by touching them, a sign to the Jacobites that he was indeed the rightful king. In 1767 John, the 9th Earl of Strathmore, married Mary Eleanor Bowes, heiress to the vast estates of her father, George Bowes. He went on to remodel the castle and the estates. 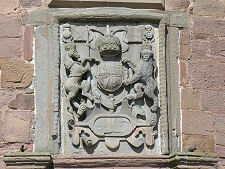 John and Mary's son, the 10th Earl, took the family name of Bowes Lyon and established a new family crest incorporating bows and lions in a punning reference to the new family name. The 13th Earl introduced gas lighting and running water into the castle in 1865. The 14th Earl of Strathmore was Claude Bowes Lyon. He and his wife Cecilia had ten children together. The ninth was Lady Elizabeth Bowes Lyon, who was born on 4 August 1900, probably at the family's town house in London. Elizabeth largely grew up at Glamis, and helped when it was used as a hospital during World War One. On 26 April 1923 Elizabeth Bowes Lyon married Prince Albert, Duke of York, the younger son of King George V. The couple had their first child, Princess Elizabeth, in London in 1926. Their second child, Princess Margaret, was born in 1930 at Glamis Castle. 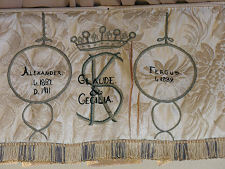 George V died in 1936, and was succeeded by Albert's older brother, who became King Edward VIII. He abdicated later the same year, and Prince Albert became King George VI. Elizabeth Bowes Lyon became Queen Elizabeth. On George VI's death in 1953 their older daughter became Queen Elizabeth II, and Elizabeth Bowes Lyon became known as the Queen Mother. Today the Queen Mother is remembered at Glamis by the memorial gates through which you enter the estate and elsewhere in the castle. Princess Margaret has a memorial in the gardens. Having approached along the avenue, visitors drive to the left of the castle past the ticket office and into the parking area beyond. From there you pass through the modern gift shop into the area immediately to the north of the castle. 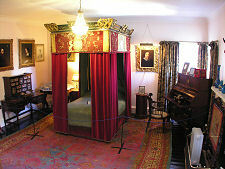 You visit the castle itself as part of one of the frequent guided tours. 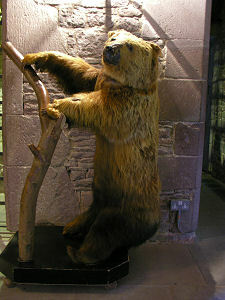 These take you through many of the rooms in the main parts of the castle and have the benefit of providing expert commentary on what you are looking at. An early highlight on the tour is the dining room, complete with sumptuous wood panelling of the finest English oak and a truly amazing ceiling. 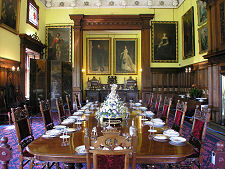 The room was installed in 1850 and when the dining table is fully extended it can seat 40 for dinner. You then descend to the crypt which is not actually a crypt, instead being one of the barrel vaulted rooms within the medieval parts of the castle. 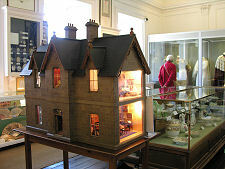 This would originally have been the "lower hall" in which the family received their visitors and dealt with public business. 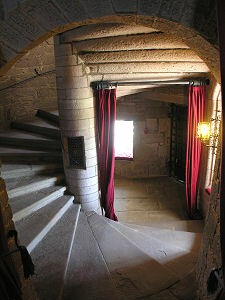 From here you climb part of the main spiral staircase of the castle (which has in total 143 steps) to the drawing room. 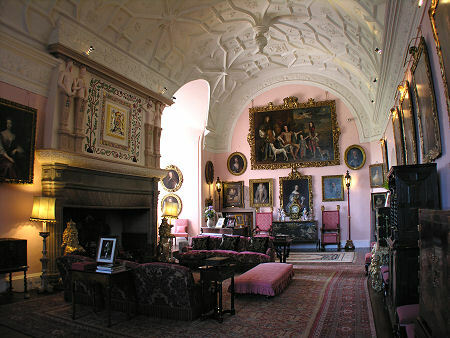 The huge vaulted drawing room, once the great hall of the medieval castle, is the highlight of the tour. Measuring 60ft long by 22ft wide, this really is a remarkable space. After admiring the drawing room you progress through the private chapel and a number of other rooms in the old part of the castle. There is then a change of styling as you tour the royal apartments, part of the castle prepared for the use of the Duke of York and Lady Elizabeth Bowes Lyon. 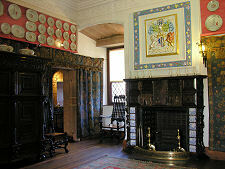 Further on you return to the castle's medieval roots in Duncan's Hall, probably a guard room in the original castle, before ending your tour in the Glamis Gallery. Here you have the opportunity to explore some of the history of the family and, in particular, the family who have lived here for so many centuries. 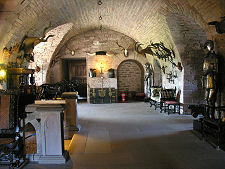 Below the gallery is the restaurant, in the old castle kitchens. Back outside you have the chance to explore the extensive gardens and grounds that surround the castle. 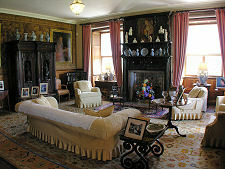 Glamis Castle, Angus, DD8 1RJ.